1 Marinate the chicken with salt and pepper powder and grill till the chicken is cooked and tender. 2 In another pan empty ¼ packet of Knorr Mexican Tomato corn soup and add 1 cup (150 ml) of water. 3 Place the pan on heat and bring the contents to a boil while stirring continuously to avoid lumps. 4 Simmer for 3 minutes. Switch off the flame and cool the soup completely. 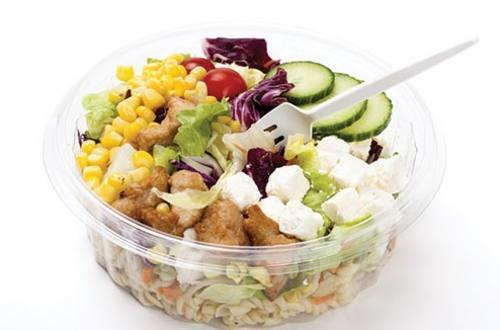 5 In a salad bowl, add sliced cucumber, tomato cubes, American corn and shredded lettuce. 6 Sprinkle salt, pepper to taste and drizzle with olive oil. 7 Add freshly cooked penne pasta and grilled chicken. 8 Pour soup over the veggies and mix well. 9 Serve on a platter, garnish with freshly chopped basil and croutons.